Copyright © 2013 Annette Hazard; all rights reserved; content may not be copied, rewritten, or republished without written permission. Most parents have a long list of household safety rules that they want to teach their children. A lot of those safety rules are related to the kitchen area in a home. The following article outlines four basic home safety rules for parents to teach their children. The first rule concerns matches. Each year, there are countless news stories about children starting fires in their homes by playing with matches. Parents are wise to teach their children a lesson about matches early on. They can take out a box of matches and explain to their children that they are dangerous and can quickly start a fire in a home. Plus, kids can get burned by trying to light matches themselves. Certainly, parents should emphasize that grown-ups are the only ones who should be handling matches. 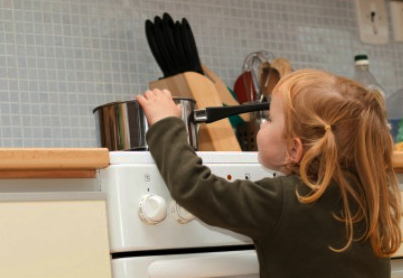 Secondly, many kids are burned by grabbing the handles of pots that are on the stove top. Its important to teach children that the handle of a pot can become hot as water, vegetables or soup are heating up inside the pot. Teach children that the proper way to lift a pot is with a potholder that protects a persons hand. But, they shouldnt try to lift a pot from the stove unless a parent says it okay to do so. But the lesson doesnt stop there; the stove top itself will stay hot for a while after the power or gas has been turned off. Explain that there is rarely a reason to put their little hands up there. But if they must reach for a close object, dont touch! Hover the hand near the stove burner to feel for any heat before proceeding. Knife safety is another topic that parents should talk over with their children. Knives are interesting to children because there are so many knives of different shapes and sizes. Once again, parents can take out a steak knife or a bread knife and show children that a knife has a very sharp edge that can cut a persons skin. Also, parents can teach their children not to reach into a sink that is full of soapy water to find a knife there. This is one of the quickest ways for a person to get a cut by a knife. If they are old enough to use a knife, explain and demonstrate that they should always cut away from themselves, never towards themselves. Finally, kids should be taught the importance of cleaning up a spill, especially if it is on a kitchen floor. A person walking on a tile kitchen floor can slip on spilled liquid and hurt him or herself. Water is an especially hazardous spill because its hard to see a pool of it on the floor. Also, cleaning up a spill right away is generally easier than waiting until the liquid has dried. If it is soda or orange juice, these types of liquids leave behind a sticky layer that is difficult to thoroughly clean up and will attract bugs. Annette Hazard is a freelance blogger that writes about home and family. At the moment she is promoting knives with http://www.bladeops.com/Benchmade-Knives-from-BladeOps-com-s/55.htm.